The world’s #1 CRM, reimagined for health care. Watch the video series: The Connected Patient Journey. See how Salesforce can help you create a connected patient journey. Transform the way you acquire, serve, and engage patients using the #1 CRM solution, reimagined for healthcare. Learn how you can create a connected end-to-end journey for patients in these animated videos. Optimise the way you reach new patients. Manage leads from any source. Deliver proactive support on any channel with a single view of the patient. Help patients engage in their own care by meeting them on any channel or device. To watch our animated patient journey videos — and get access to a lot of other great Salesforce content — just fill out this form once. Transform the way you acquire, serve, and engage patients using the #1 CRM solution, reimagined for healthcare. Learn how you can create a connected end-to-end journey for patients in this animated video. 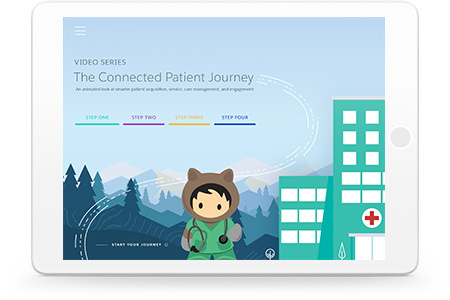 To watch our animated patient journey video — and get access to a lot of other great Salesforce content — just fill out this form once.